Ultra-high-energy cosmic rays (UHECRs) are the most energetic particles in the Universe, but so few have been observed that we know very little about them. The Telescope Array in Utah is attempting to solve the mystery of these particles: where do they come from and what could have accelerated them to such high speeds? Most of the science that we talk about here on Astrobites uses the radiation emitted by astrophysical sources. But these sources produce more than just photons: particles such as neutrinos, protons, and alpha particles can also be detected. “Cosmic rays” are elementary particles of extraterrestrial origin, consisting mostly of protons (hydrogen nuclei), alpha particles (helium nuclei), and heavier nuclei (such as carbon, nitrogen, and oxygen). Smaller numbers of electrons and positrons can also be seen, as covered in this Astrobite. Cosmic rays can have a wide energy range, from around 10^9 eV to 10^20 eV (a proton at rest has an energy of about 10^9 eV, but its total energy can become much higher when moving relativistically). If we plot the flux of observed cosmic rays as a function of their energy, we get a plot like in Figure 1: a remarkably smooth curve that appears to follow a power law. While in general the spectrum follows (Energy)^-3, there are two noticeable features where the power law changes, known as the “knee” and “ankle” respectively. Figure 1: The Cosmic Ray energy spectrum, over a wide range of energies. The x-axis is the energy of the cosmic ray, while the y-axis denotes the flux, or occurrence rate of particles with those energies. Different colors indicate different experiments. 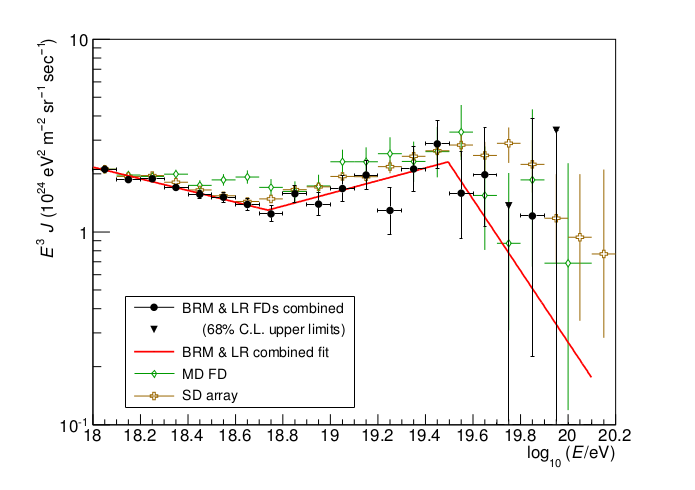 This paper focuses on the detection of ultra-high-energy cosmic rays, which are loosely defined as particles with kinetic energies above 10^18 eV, at or above the “ankle” on the above plot. The origin of these highly energetic particles is poorly understood, mainly due to their small numbers. What mechanisms could accelerate a subatomic particle enough that it has the equivalent energy of a baseball thrown at 50 mph? A primary theory is the Fermi acceleration mechanism, in which cosmic rays are accelerated through multiple strong shock fronts. These shocks could arise in a number of astrophysical environments, such as supernova remnants, colliding galaxies, and active galactic nuclei. However, so far the number of observed UHECRs is so low that it no correlations have been made with specific sources. How can we detect one? Direct detection of UHECRs is difficult because the flux is very low, due to the atmosphere and the energy dependence of the physical processes that create them. Given a collecting area of 1 square kilometer, you would only expect a single cosmic ray event per year! It is possible, however, to use the Earth’s atmosphere itself as a detector. 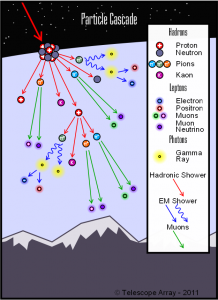 When UHECRs interact with the air, they produce a correlated cascade of secondary particles known as an “air shower.” Specifically, a cosmic ray interacting with a nucleus near the top of the atmosphere produces many pions. Charged pions will probably collide with another nucleus in the air and produce a similar cascade, known as a hadronic shower. Neutral pions will probably decay and produce gamma rays, which in turn interact with more nuclei to produce electron-positron pairs. These pairs can produce “bremsstrahlung” radiation in what is known as an electromagnetic shower. We can observe these showers to determine the energy and direction of the initial particle. Figure 2: A schematic of a particle cascade induced by a cosmic ray interacting with the atmosphere. Operating in western Utah, the Telescope Array is the largest UHECR detector in the northern Hemisphere. It consists of 507 “surface detectors” which directly detect secondary particles from an air shower, and 3 “atmospheric fluorescence detectors” (FDs) which are the focus of this paper. Fluorescence refers to the process by which an atom absorbs radiation of one wavelength, and emits photons of a longer wavelength. In the case of the FDs, the air showers described in the previous section causes ionization and excitation of the gas molecules (mostly nitrogen) in the atmosphere. These molecules fluoresce and emit ultraviolet radiation, which is what the FDs detect. Each FD consists of 12 telescopes scanning a 30 degree range in azimuth (the two used in this analysis have significant overlap). 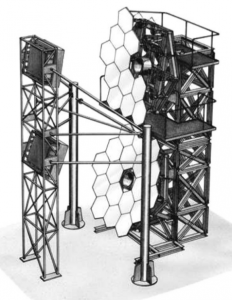 Each telescope has a 3.3 meter spherical segmented mirror and a camera consisting of 256 photomultiplier tubes (PMTs). When a flash of UV light from fluorescing nitrogen hits the mirror, it is imaged onto the PMTs and its time of arrival is carefully recorded. In this way, cascade events can be reconstructed using the timing of UV flashes and their directions on the sky. Using large Monte Carlo simulations of observations of various cosmic rays, the authors are able to determine what different events will look like through the PMT arrays. Figure 3: A schematic of the Fluorescence Detectors, showing the mirror reflecting onto the PMT camera. The FDs observed from 2008 to 2011, but data were only taken from moonless nights with good weather for best sensitivity. Combining the data from the two detectors, taking into account common events, results in the spectrum shown in Figure 4. The plot shows the flux of cosmic rays as a function of energy multiplied by (Energy)^3 to better show changes in the power law spectral index. Figure 4: The cosmic ray energy spectrum from the FDs (black circles), with a twice-broken power law fit. As expected, the spectrum shows two breaks in the spectral index: the power law increases a bit at 10^18.74 eV, and decreases again at 10^19.5 eV. The high energy break is associated with the Greisen-Zatsepin-Kuzmin mechanism (a theoretical upper limit on the energies of UHECRs based on interactions with the cosmic microwave background) and is detected with 3.2 sigma significance relative to a model with no break. The result is in agreement with other UHECR measurements from other experiments such as the Pierre Auger Observatory. Although this result did not show anything unexpected, it is an important stepping stone on the way to collecting enough data to definitively answer pressing questions about UHECRs. To narrow down their origins and acceleration mechanisms from a wide variety of theoretical options, we desperately need more observations! thanks for this writeup. please sir, what is the impact of cosmic rays on the atmosphere and other meteorological parameters.